At the University of Pennsylvania, I am a practicing Rational Emotive Behavior Therapist who also trains junior psychologists in REBT\cbt. I see a wide range of patients experiencing very difficult clinical disorders and life adversities. I teach cognitive behavior therapy at New York University to graduate students in professional counseling. I am an author and a disseminator of Rational Emotive Behavior Therapy. I maintain a website REBTDoctor.com aimed at making REBT available for self-study. Psychologist Walter J. Matweychuk, Ph.D.
Dr. Matweychuk attended the William Penn Charter School in Philadelphia. He earned his B.A. (1982) and M.S. (1984) from the University of Pennsylvania. He then went on to earn a M.A. (1986) and Ph.D. (1990) from Hofstra University. Dr. Matweychuk is a unique practitioner of Cognitive Behavior Therapy in so far as he has worked closely with both Dr. Albert Ellis and Dr. Aaron T. Beck who are the two founding fathers of cognitive behavior therapy. His psychotherapeutic work is influenced by both of these pioneers of the field of cognitive behavior therapy. Dr. Matweychuk first became exposed to Cognitive Behavior Therapy as an undergraduate at the University of Pennsylvania in 1979. There he worked at the Center for Cognitive Therapy under the direction of Dr. Aaron T. Beck the originator of Beck’s Cognitive Therapy. He was the scribe during Dr. Beck’s weekly group supervision for more than a year and studied closely how Dr. Beck taught his group of psychologists how to use Cognitive Therapy to treat emotional disorders. As a doctoral student at Hofstra University, Dr. Matweychuk completed his clinical internship and fellowship at the prestigious Albert Ellis Institute in New York City. For several years he worked under the direct supervision of Dr. Ellis the creator of Rational Emotive Behavior Therapy. He became a certified supervisor in Rational Emotive Behavior Therapy and following his training Dr. Matweychuk was invited to join the professional staff and provided outpatient psychological services at the Institute for an additional number of years. He continues to provide clinical supervision to mental health professionals who attend training practica at the Albert Ellis Institute. Dr. Matweychuk has 27 years of experience practicing Rational Emotive Behavior Therapy. In addition to his private practice in Rittenhouse Square, Philadelphia, Dr. Matweychuk is affiliated with the University of Pennsylvania psychiatry department of the Perelman School of Medicine. From 2009 through 2014 Dr. Matweychuk returned to work for Drs. Aaron T. Beck and Gregory K. Brown at the Aaron T. Beck Psychopathology Research Center at the University of Pennsylvania. He worked on multiple research projects involving suicide prevention, the assessment of the impact of safety plans on suicidal behavior, and the training of mental health professionals learning Beck’s Cognitive Behavior Therapy. In 2015 he joined the staff at Penn Behavioral Health Center of the University of Pennsylvania Health System. There he conducts psychotherapy with a wide range of outpatients and also trains and supervises doctoral students in clinical psychology on how to conduct Rational Emotive Behavior Therapy\cognitive behavior therapy. Dr. Matweychuk is also an adjunct professor of psychology at New York University where he teaches a graduate course on Cognitive Behavior Therapy in the Steinhardt School of Culture, Education, and Human Development. Dr. Matweychuk has co-authored Overcoming Your Addictions (2000) with Dr. Windy Dryden. 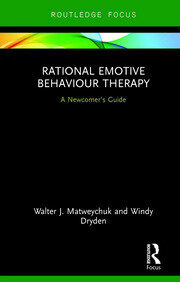 His second book titled Rational Emotive Behavior Therapy: A Newcomer’s Guide (2017) is written for professionals and is straightforward guide aimed to introduce the newcomer to the core theoretical principles and therapeutic strategies of Rational Emotive Behaviour Therapy (REBT). Dr. Matweychuk earned a varsity letter in football at the University of Pennsylvania. He has also completed 13 consecutive New York City Marathons from 1990-2002. His vitally absorbing interests include the dissemination of Rational Emotive Behavior Therapy and Cognitive Behavior Therapy, physical and psychological fitness, travel, photography, and fine dining. 1. The similarities and differences of Albert Ellis's Rational Emotive Behavior Therapy (REBT) and Beck's Cognitive Behavior Therapy (CBT).